From the airport we decided to take a shuttle... Probably a mistake since it took so long to get here, but it was much cheaper than a cab. The hotel was very accomodating and checked us in right away (though very early). The Halekulani is an amazingly high class hotel with a super staff. We walked around Waikiki for a bit and then took a nap. Then we got ready for dinner. 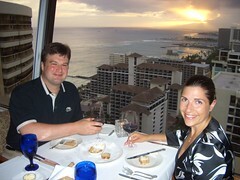 Holly had made reservations at the Hanohano Room in the Sheraton Waikiki. It was pretty snazzy. Holly was dressed in a gorgeous dress. I wore slacks and a golf shirt (I'm a bumb). We walked to the Sheraton and took a private elevator up to the 30th floor. The restaurant had a very nice feel. And it got better. We had a couple cocktails and ordered a Ridge "Lytton Springs" Zinfandel. We started with a Crab Gratin dip. We split a tableside-prepared caesar salad. Holly ordred a Filet and I ordered the Sea Bass. The appitizer, the salad and both entrees were amazing. Then we had "seasonal fruit flambe". <beavis>Fire, fire, fire!</beavis> This was a fantastic dinner. This was our last night in Hawaii. We're going to see Pearl Harbor tomorrow and then catch a plane home. Hope you enjoyed the commentary. More pictures to come.